For his first attempt, François Gabart the skipper of trimaran MACIF set a new solo round the world record in 42 days 16 hours 40 minutes and 35 seconds, he improved by 6 days 10 hours 23 minutes and 53 seconds the time set on 25 December 2016 by Thomas Coville (49 days 3 hours 4 minutes 4 minutes 28 seconds). 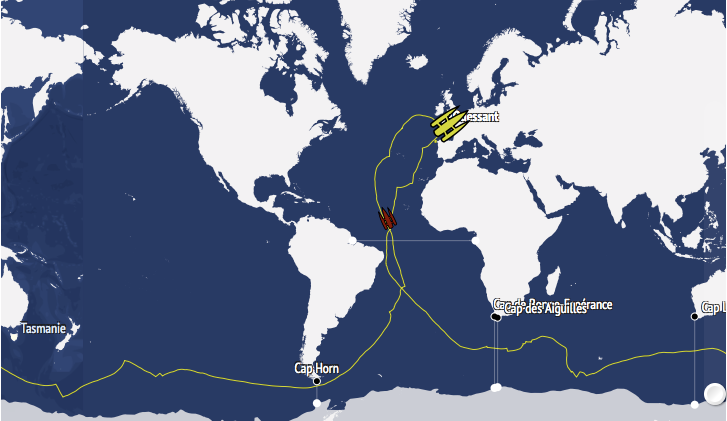 His time is the second best overall, crew and solo sailor in the round the world race, with only IDEC Sport (Francis Joyon) having done better on 26 January 2017 on the Trophée Jules-Verne (40 days 23 hours 30 minutes and 30 seconds). François Gabart left Ouessant at 10:05 a. m. on Saturday, November 4 and crossed the finish line for his solo round-the-world race between Cap Lizard and Ouessant at 2:45 a. m. (French time) on Sunday, December 17. The MACIF trimaran will have actually covered 27,859.7 miles, her actual average on this course is 27.2 knots. French sailor Francois Gabart has taken just 42 days to circumnavigate the globe single-handed non stop. How sailing has developed in the last 50 year. and in 1988 Philippe Monnet more of 129 days.